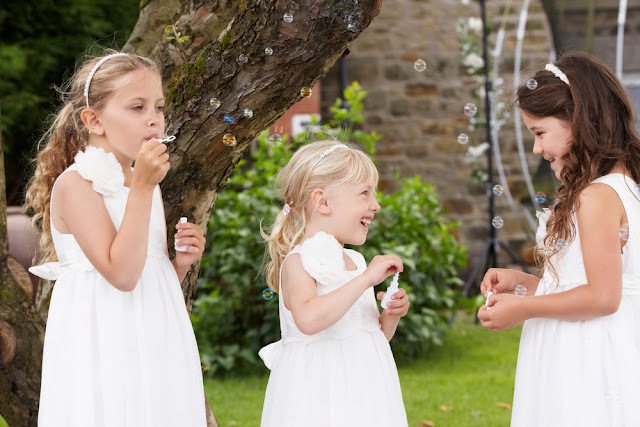 If you are planning a wedding that children are invited to, you will want to make special arrangements to keep the little ones entertained so that the adults can enjoy the celebration. There are lots of simple things that can be done to accomplish this, and many of them are even fun for the grown-ups too. WhereBridesGo.com has pulled together a list of ideas for you in today's blog. 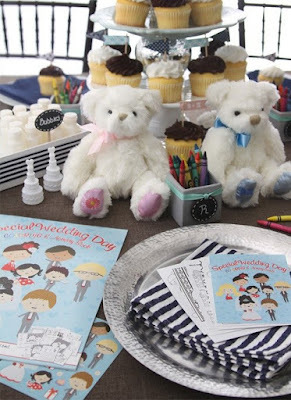 If the kids will be sitting with their parents at the reception, you can add a touch of whimsy to their place settings to make them feel extra special. Make their place mat out of a material that can be drawn on, and provide colored pencils or crayons in a cute container that matches your wedding colors. You can find adorable activity books in our online wedding accessory store, and they even include the crayons and a sheet of stickers. Kids aren't always patient when it comes to waiting for the food to be served, so it might be a good idea to have a simple snack waiting for them at the table. 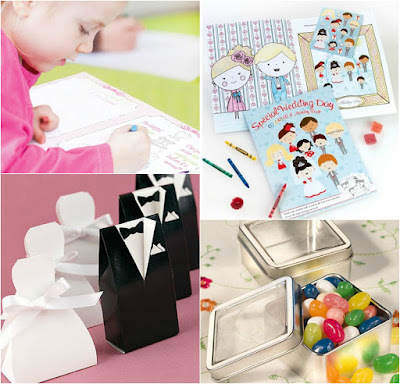 WhereBridesGo.com has lots of adorable containers that are perfect for that. You could even have a fun cup, complete with a lid and straw to reduce drink spills, that doubles as something useful and a favor for them to take home. If the children are old enough and wouldn't mind sitting away from their parents, you can designate an entire table just for them. 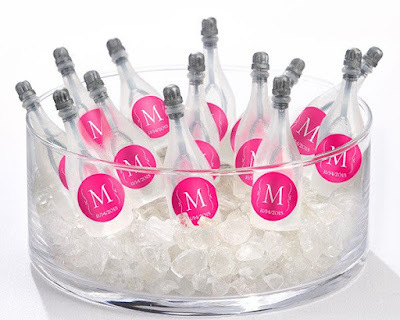 It can mimic the regular reception tables, but with a few fun additions like stuffed animals or a bouquet of lollipops instead of flowers as a part of the centerpiece. Set aside a specific area for the kids to have some fun without any adults getting in their way. A side table can be filled with bubbles, board games, and toys for entertainment. It can be near the dance floor so parents can still keep an eye on them, and if the kids hear a song they can't resist, they are only a skip away from hitting the dance floor with mom and dad. Just make sure that the activity table is not too close to any loud speakers. If the weather is nice and you have access to an outdoor area, set up a few lawn games. This is a popular activity for grown-ups too, so vary the difficulty levels so that everyone can have a good time. The kids would also love it if you set up a play tent for them to "make-believe" in. If you want the parents and grandparents to be able to take their minds off of worrying about the little ones, hire a babysitter to keep an eye on the entire bunch. You can put them in charge of an activity area, or make arrangements for a room near the reception for the sitter to entertain all the kids in. Take it a step further, and hire someone to watch the kids that also has a special skill, like music, magic, or even a funny clown act. If you really want to blow their minds, rent a giant bounce house for the kids to play in. We almost guarantee, though, that a few of the adults will make their way into that too! Children don't always have the patience or attention span that adults do, but when you plan activities and treats especially for the kids, the parents might actually be ready to head home before the young ones are! You will find things to please kids at your reception at WhereBridesGo.com. There are also lots of adorable flower girl & ring bearer gifts for the children taking part in your wedding too. 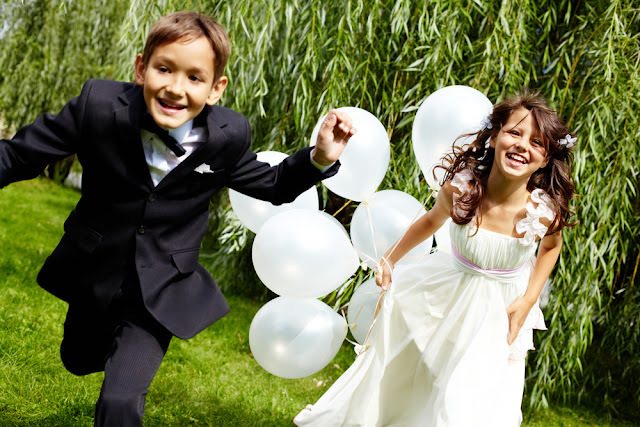 If the kids are happy, the grown-ups are happy, so everyone at your wedding reception can have an incredible time.